Also called microlubrication and developed for the lubrication of high speed roller bearings tipically found on spindles and electrospindles, be using and air/oil mixture. 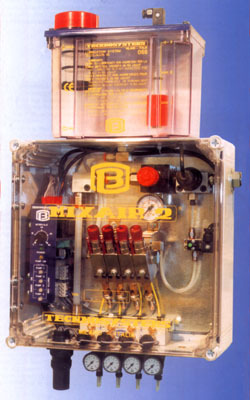 The mixair lubricator is either an oil/mist or an atomizer system because low pressure air is used to convey the lubricant to the lubrication point. The mixair units is available with single or multiple outlets. The distributor injects a small amount of lubricant into the air stream which is carried to the nozzle which breaks it into micro particles at that point of delivery. Flows to individual point per operation can be adjusted from 3-24 mm3 and therefore called micro quantities.